The year was 387. The place was Kilpatrick in ancient Scotland. Their names were Calpurnius and Conchessa, Roman citizens living at the edge of the Roman Empire. These young Britons were gifted with a new born son. They named him Maewyn. Maewyn was a rambunctious, unruly boy who spurned his parents’ instructions and their Christian faith. He romped the Scottish hills with other Brit, Scot, Pict, and Roman boys, and it was on one of these romps that young Maewyn ended up in the wrong place at the wrong time. A roving band of Irish pirates was plundering the coast of Scotland, and in the process, captured Maewyn and carried them back to Ireland. There Maewyn became a slave. And there, Maewyn’s faith was reborn. He began to talk to God, and as the story goes, God began talking to him. God instructed Maewyn to wander toward the coast. So he did, secretly, and found a boat bound for Scotland. He returned home and was reunited with his family after many years. Then God spoke again, coming to Maewyn in his dreams. God wanted him to return to Ireland. Maewyn entered theological training, and at the conclusion of his studies, was sent as the first Christian missionary to Ireland. At his ordination he took the Latin name, Patricius; in Gaelic it was Padraig. 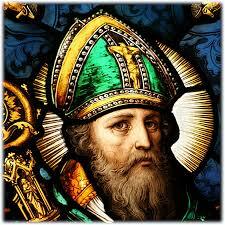 In modern English we know him as Saint Patrick. With Nicholas and Valentine, St. Patrick rounds out the trio of best known Christian saints outside of the Apostles. They are celebrated and venerated by the world – but none more so than St. Patrick. He has found his way into our hearts, and while drinking Guinness or Jameson is part of his appeal, that is hardly the beginning. Patrick, more than most, meets people where they are – and that is his lasting contribution. When Patrick arrived in Ireland as a Christian missionary he had a decision to make about how to do his work. This was the early 400s. The Roman Emperor Constantine had “converted” to Christianity 100 years earlier, and the cross was now used, not as the suffering symbol of a Galilean carpenter, but as a crusading tool of conquest. It was the custom of Christian missionaries – then and for the next 1500 years – not to introduce others to Jesus, but to make them citizens of the Empire. A culture was “Christianized” not when it conformed to the words and ways of Jesus, but when it submitted to the rule of the Roman Caesar or the conquering king. The local culture was eradicated, replaced by that of the conquerors, and Christianity was used as an instrument in that process. But rather than imposing an imperial faith on the Irish people, Patrick met them where they were and let faith erupt naturally. He did not overpower, he obliged. He did not impose, he invited. He did not attack, he adapted. He came in humility and simplicity, attempting to foster faith, not force it. We still have much to learn from old Patrick, for his way of sharing faith could heal today’s world. Vulnerability. Service. Humility. Meeting people where they are. Treating neighbors with dignity and respect. Honoring the lives and stories of those we encounter – plain civility – may be the only way to keep a society from devouring itself. When we live with a no-compromise, never give-an-inch, militant attitude, and meet every person outside our circle with distrust, it creates a divisive, violent, negative, attack-based culture with an atmosphere of hateful rhetoric and suspicion. It destroys a community. So we who are living today have a choice put before us: We will take the path of suspicion, violence, stubbornness, divisiveness, and imposition and we will witness the end of the world as we know it. Or we will we imitate Patrick by taking the way of peace, love for our neighbors, welcome and inclusion. Living this way will end of the world as we know it as well – but it might be the kind of end that gives rebirth to the world.